The Inbestigators: Some eleven year olds wash dishes for pocket money, others solve crimes. 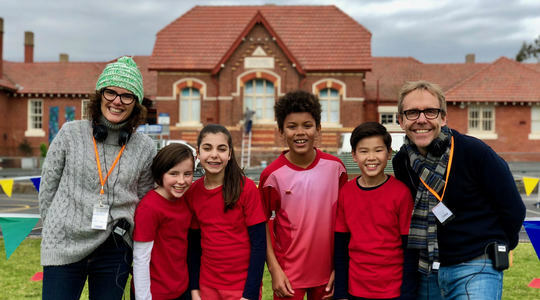 Created and produced by Robyn Butler and Wayne Hope, the twenty-part half-hour series takes place in a detective agency run by eleven year olds and stars four incredibly talented children: Abby Bergman, Anna Cooke, Aston Droomer and Jamil Smyth-Secka. Ezra, Maudie, Ava and Kyle are The Inbestigators. Operating out of the granny flat in Ezra’s backyard, these disparate kids are led by Maudie, a freakishly gifted observer of human behaviour, who manages to solve one thorny school or neighbourhood mystery after another. While every episode offers a compelling puzzle to crack, at its core the show is a character comedy with heart. The Inbestigators will be filmed on location in Melbourne from July to November of 2018 and will screen in 2019 on the ABC in Australia and internationally on Netflix. Gristmill co-founders Robyn Butler and Wayne Hope are prolific creators of Australian comedy who have found enormous success with Upper Middle Bogan, The Librarians and Very Small Business. Their upcoming comedy Back in Very Small Business will screen on ABC later this year. Butler and Hope say: We’re delighted to be combining two of our favourite things: kids and crime. Okay, that sounds wrong… We mean we’re excited to watch our eleven year old detectives crack the very big cases like who stole Pixie’s solar system diorama? The Inbestigators is written by Robyn Butler, Wayne Hope, Molly Daniels, Lisa Marie Corso, Maddy Butler, Jayden Masciulli, Bob Franklin, and directed by Wayne Hope, Robyn Butler, Ian Reiser, Nina Buxton and Tim Bartley. The series is Executive Produced by Butler and Hope alongside Greg Sitch, and Bernadette O’Mahoney for the ACTF. The Inbestigators has principal production investment from Screen Australia in association with Film Victoria.